We're able to finally put a wrap on a crazy February. Last month was filled with the excitement of the Super Bowl and the Winter Olympics, but also saw continued political bickering in Washington and the horror of the school shooting in Florida. On top of all of that, we saw more volatility in the stock market than we have seen in more than two years. But there's one thing about the month of February that I'd like to share my thoughts about. February is Black History Month. I was watching a brief video put out by the Clemson football staff earlier this week and they mentioned that there was a presentation by the first black football player at Clemson, Marion Reeves, to the student athletes. Tiger great Jeff Davis said, "We were intentional in calling it history, not black history, because we believe ... black history is a part of all history." I've known Jeff to be a smart, thoughtful man, ever since I first met him. It just so happens that when I first met him in 2000, he was hiring me to install the landscaping in his new home in Clemson. I hadn't really heard much of the story of Marion Reeves, though. I decided to look it up and found this 2010 articlefrom the Charleston Post & Courier. It's a pretty amazing story of courage, not just by Reeves, but all of the men in the football program and the school, during a time when racial issues had left many raw nerves exposed. There was an important person in the story of Mr. Reeves arrival at Clemson - President Robert C. Edwards. While I was a student at Clemson and working for the Clemson Athletic Department, I would often see this elderly man around the locker rooms and athletic department gym (back then, there was one gym for all of the athletes). He was the only non athlete or coach that would use those facilities. Finally, one day I asked my boss who that old guy was and why he got use of the facilities. He immediately put me in the truck and we drove up so he could personally introduce me to the great R.C. Edwards. 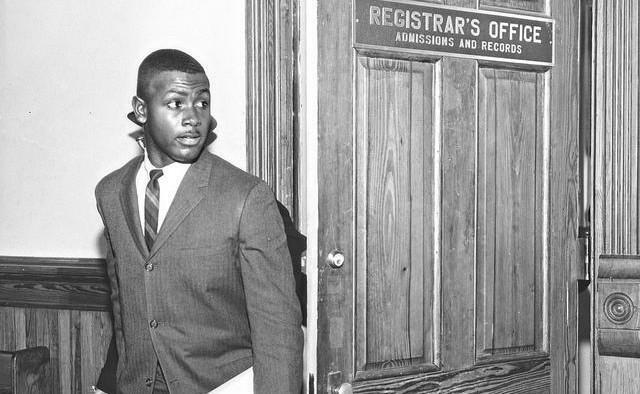 He explained that because of him, Clemson desegregated without the violence seen in places like Alabama, Arkansas, Mississippi, and Athens, Georgia. I learned that he was the longest serving President at Clemson, led the move to turn the small agriculture school into a great research University, and was almost single handedly responsible for convincing the Army Corps of Engineers to build the damns on the edge of the campus while building Last Hartwell in order to save the campus from being flooded. 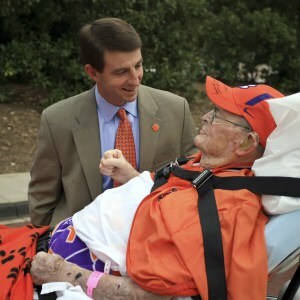 He was a huge supporter of Clemson Athletics and one of the nicest men you would ever meet. You can hear the love for Clemson in his farewell letter to the students when he retired. I find it amazing that he lived another 9 years after I graduated, to the age of 94. I guess all of that working out was good for him! I've since also read up on how it came to be that Harvey Gantt became the first black student at Clemson College. I can't imagine the courage it took for him to fight that battle and for Dr. Edwards to craft his plan to peacefully integrate in 1963. As you read the history, you realize that there were so many setbacks and hurdles along the way. Dr. Edwards knew desegregation was inevitable and was determined that Clemson would do it in a way that would look good for not only the school and its students, but the entire state of South Carolina. This is a history of the desegregation of Clemson that was done by a history professor at Clemson. I'll warn you that it's a long read., but I think worth the time. It often seems that we are living in a world that is more divided than it's ever been. But I think we need to take time, and Black History Month is a perfect time, to remember back to another time that our country was deeply divided. We take it for granted that a person, no matter the pigment of their skin, has the ability to go anywhere and do what they desire in the United States. We NEED to learn about the struggle, so that we aren't destined to go back there again. And the legacy that I take from Marion Reeves, Harvey Gantt, and Dr. Edwards - we need to listen to everyone, be thoughtful of their concerns, and carry yourself with dignity and restraint.